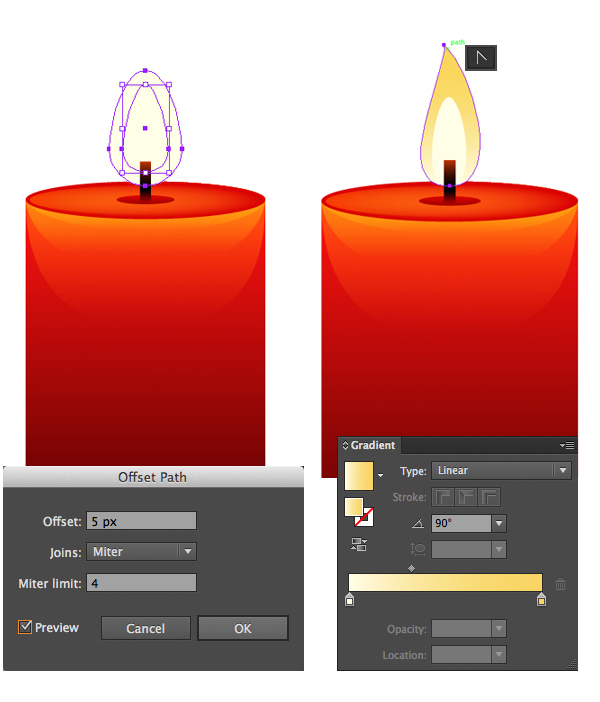 GFX9.COM share How to create a winter candle lantern in adobe illustrator, you can download now. 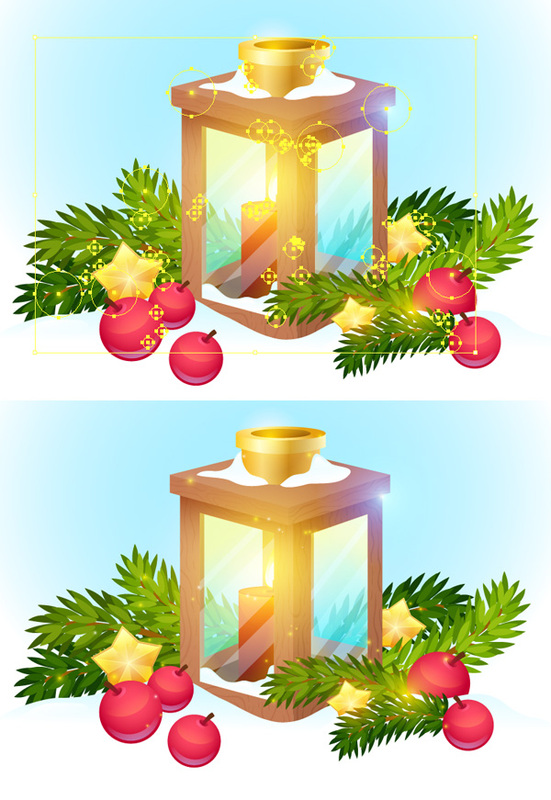 Tags: adobe illustrator, christmas, illustration, vector, vibrant, winter. We can’t but agree that winter is one of the most beautiful seasons, when nature is sleeping peacefully, covered with pure white snow. 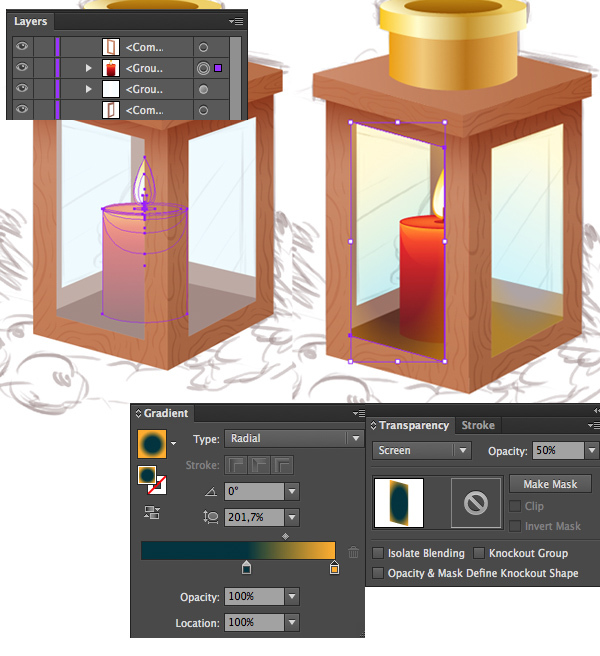 Let’s make it less chilly and more enchanting by creating a warm and cozy illustration of a wooden candle lantern. 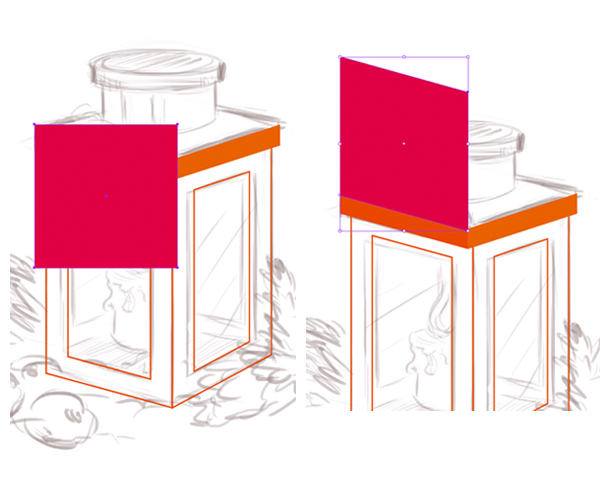 We’ll be using basic shapes, warp effects, and some simple freehand drawing. Let’s start! 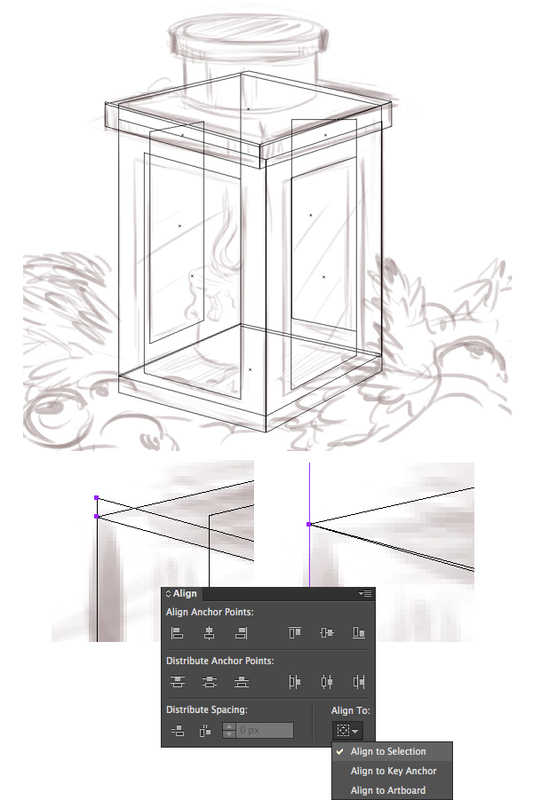 We’ll start by placing our sketch onto the Artboard of 600x600 px size and turn the sketch layer to a template by double-clicking it and ticking the Template box. 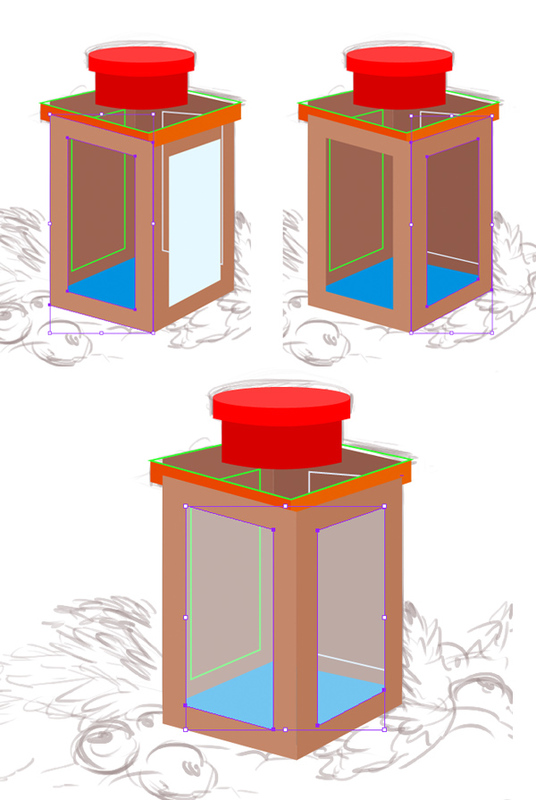 You can draw your own simple draft, or use the sketch from this tutorial by downloading the image below directly to your computer. Now let’s add the first element of our lantern. That will be its front part. Make a rectangle with the Rectangle Tool (M) and use the Direct Selection Tool (A) to select its upper and lower right anchor points. 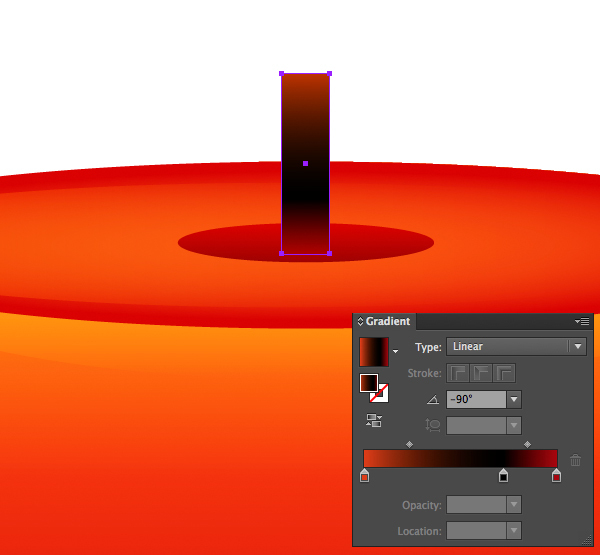 Drag the points down to make the shape slightly skewed, as shown in the screenshot below. Here is how it should look after this simple transformation. 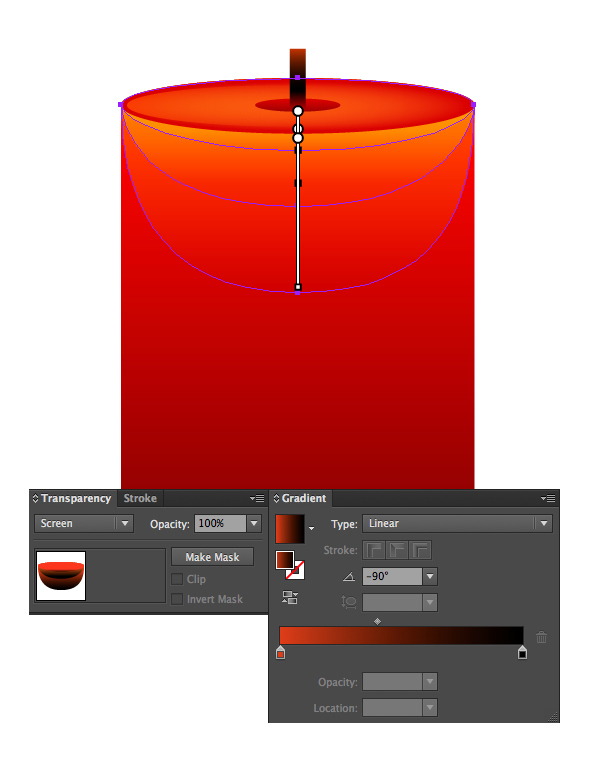 Select the created shape and use the Reflect Tool (O) to mirror the object over the vertical axis, thus creating the second frame. 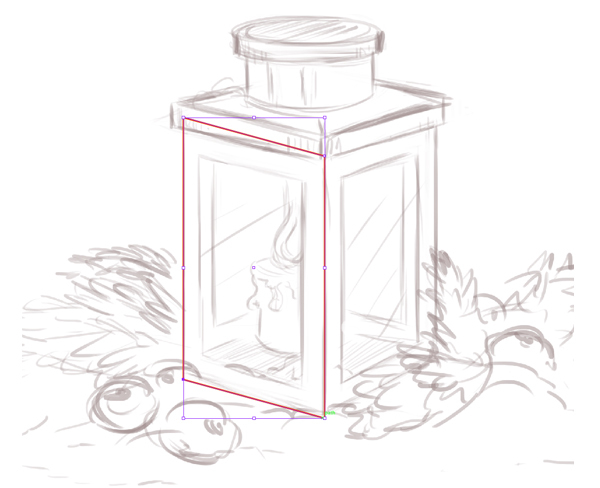 Squash the shape slightly to make it fit the perspective of our lantern. Select the first frame, which is on the left. Go to Object > Path > Offset Path and set the Offset value to -15 px (or set another value, using the Preview option so that the new shape fits your sketch). 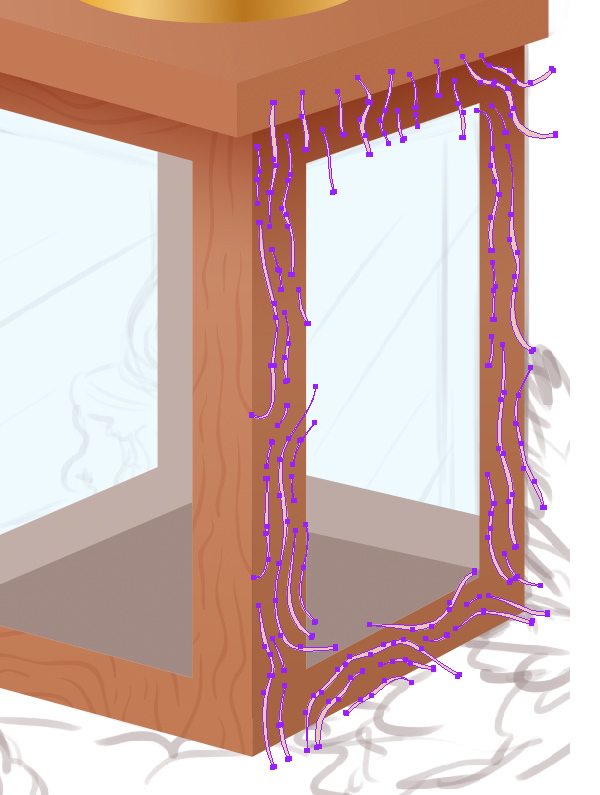 Make the same actions for the second frame, this way forming two holes for the window glass. 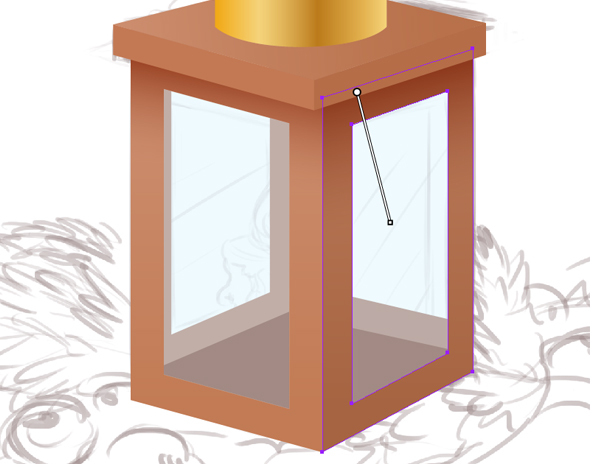 Now we need to render the top part of our lantern. 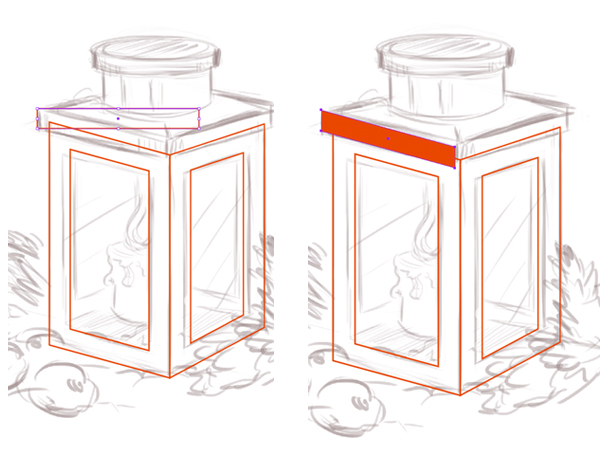 Create a narrow rectangle and skew it the same way as we did with the frames of the lantern, by moving the side anchor points down. Add the second edge and put it in its proper place. The next thing to do is to add the “roof” to the lantern. 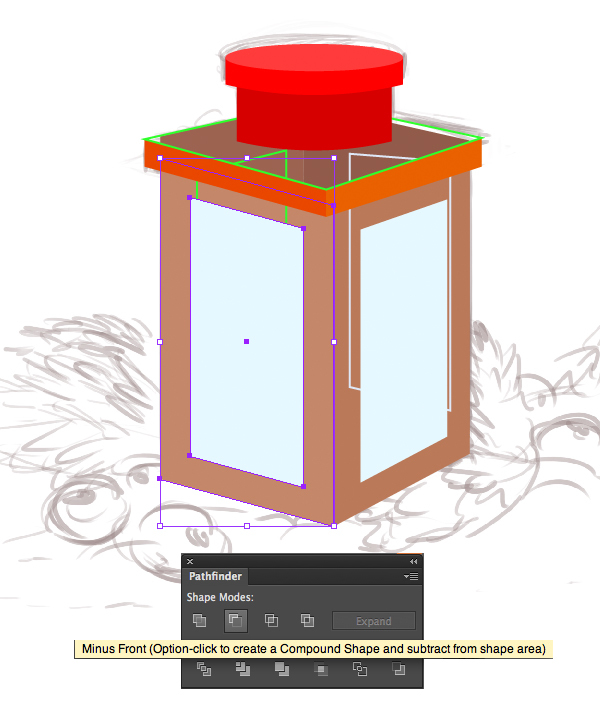 For this purpose, form an even square with the Rectangle Tool (M) and skew it, moving its right side anchor points down. For this step we need the Smart Guides to be turned on (View > Smart Guides). Select the two upper anchor points of our square, and drag them down and to the right in order to make the square flat. 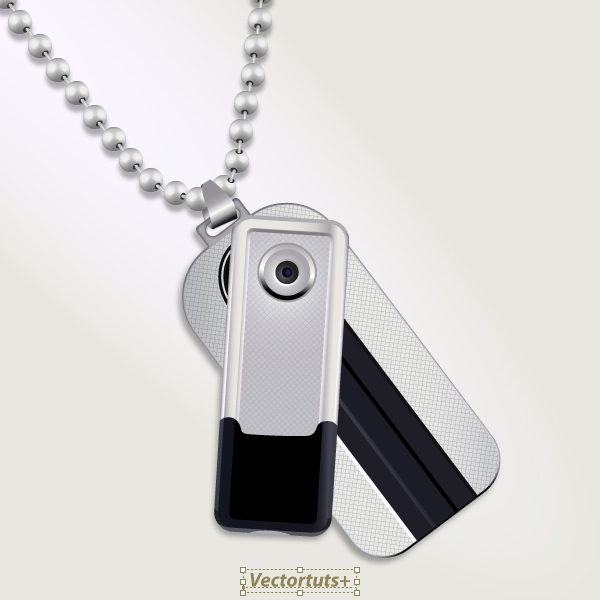 Smart Guides will help to snap the object, placing it in the needed position. 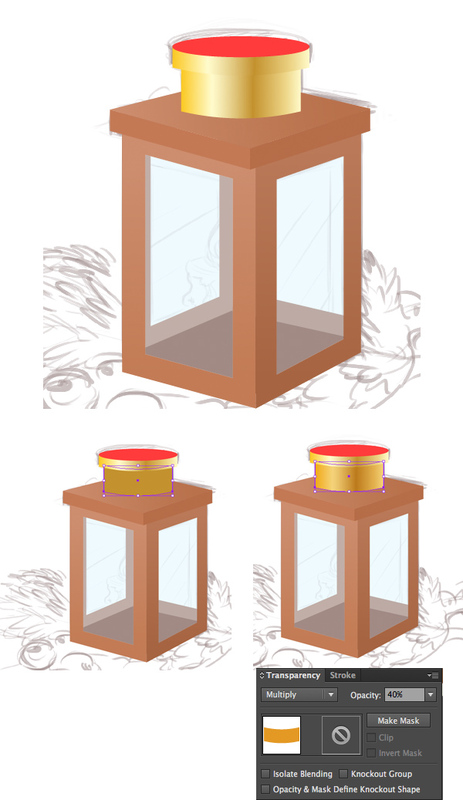 Add the inside bottom part of our lantern in the same way, forming the “floor” on which we are going to place the candle. Let’s switch the fill color of the lantern parts to some random hues just to see how it looks. Don’t forget to add the two back faces of the lantern (greyish-blue in the screenshot), as they will be visible too. It may happen that some of the elements of our lantern do not match each other. We can fix it easily by repositioning the anchor points in a few clicks. First of all, let’s switch to Outline Mode (Control-Y). 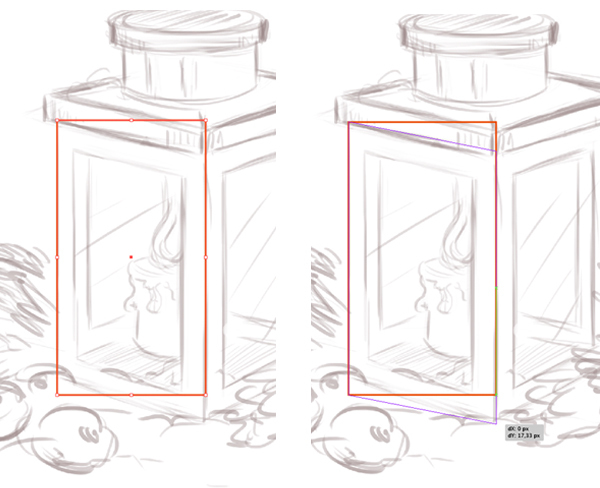 Notice that our sketch is still visible, as we’ve turned it into a Template. Zoom in and check the edges of the lantern. Find the mismatching place and select those anchor points, which you need to put in the same position. Now turn to the Align panel and select Align to Selection. Finally, click on the middle positions of the Align Anchor Points and Distribute Anchor Points. Now our points are aligned and perfectly matching! Check out the other edges and fix them if needed. The next element of our lantern is a so-called “chimney” on the top. 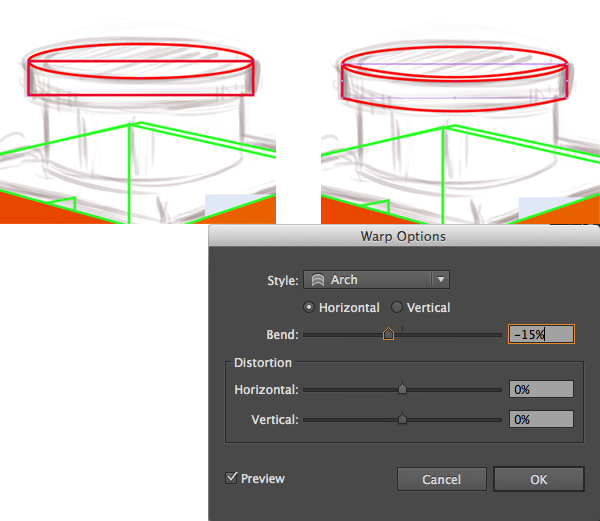 Start by forming a squashed ellipse with the Ellipse Tool (L) for the upper part of the chimney. Add a narrow rectangle, so that its upper anchor points match with the side anchor points of our ellipse. 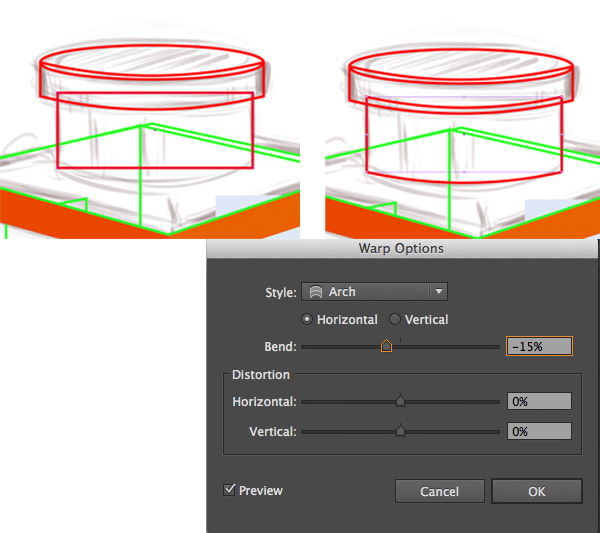 Go to Effect > Warp > Arch and set the Bend value to -15%, Horizontal in order to make it slightly arched down. Add another rectangle for the foundation of our chimney. Apply the same Arch effect to the rectangle, bending the shape. Put the ellipse that we’ve created on top of all other objects (Control-Shift-]), select all parts of the chimney and open the Align panel. 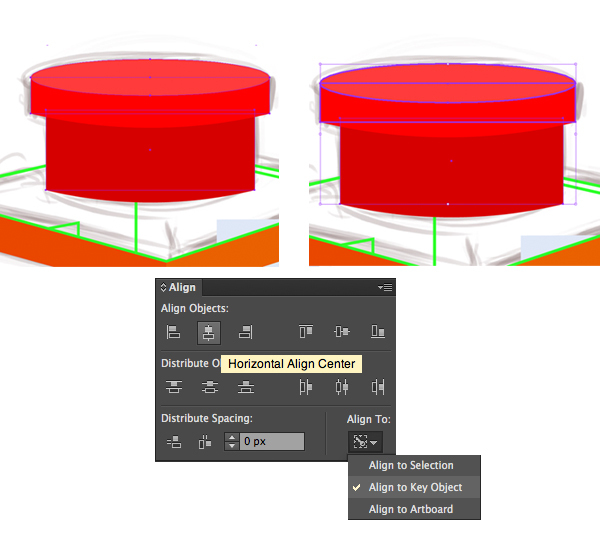 Set Align to Selection and click the Horizontal Align Center to line up the objects. 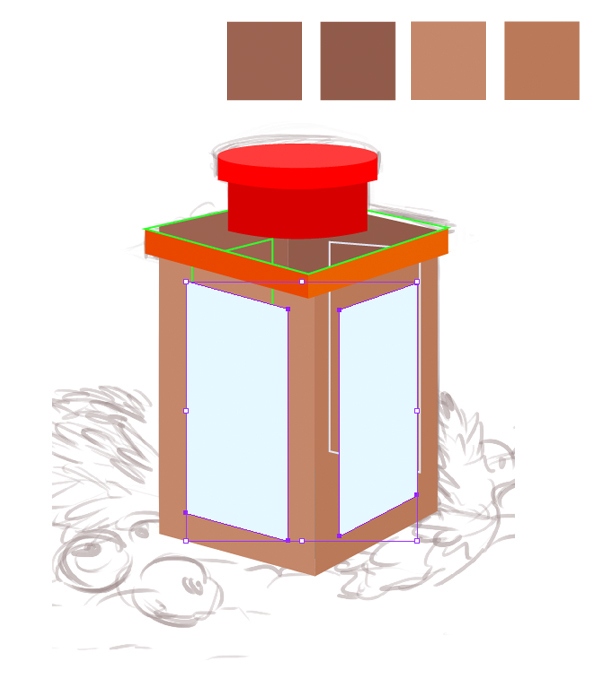 Let’s enliven the lantern by coloring it into appropriate wooden shades. Start from the back sides, making them dark brown. 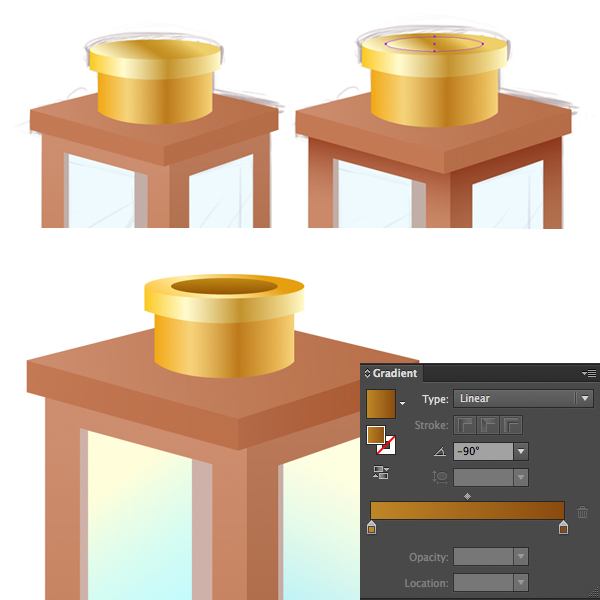 Apply lighter brown colors to the front faces of the lantern. Switch the fill color of the windows to light blue. You can also check the palette for wooden parts in the screenshot below. 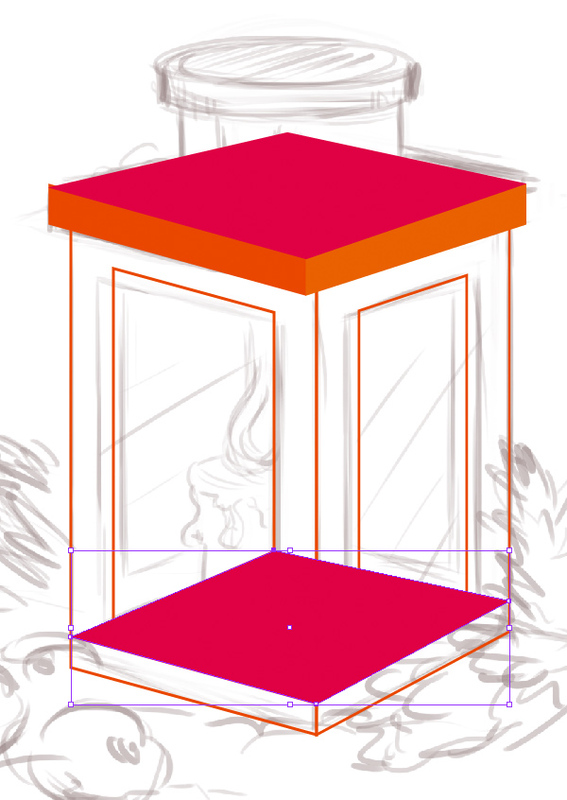 We need to cut out the window openings to make the back parts of the lantern visible through the glass. 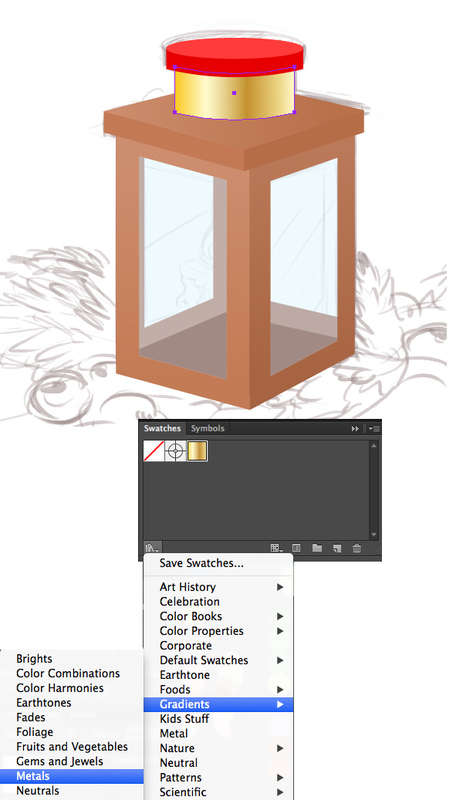 For this purpose, copy the glass shapes and keep them, as we’ll need them later (you can hide these copies by clicking the eye icon in the layers panel). 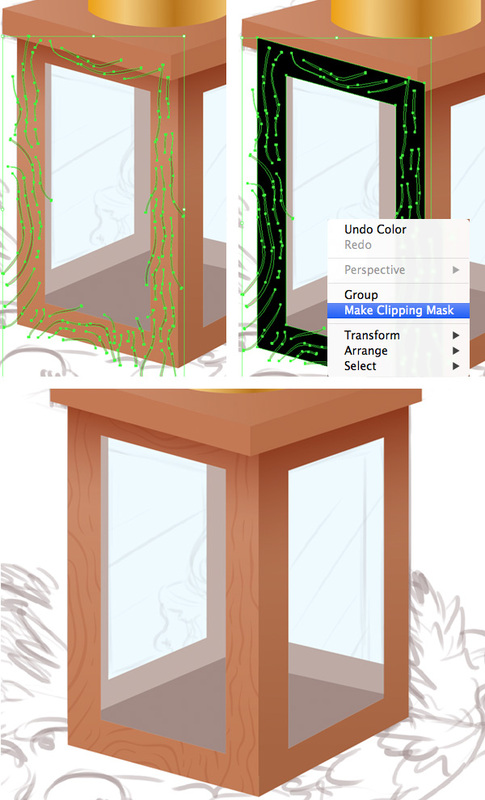 Select both the glass part and the wooden side behind it, and use the Minus Front function in the Pathfinder panel. As a result, you get a hole of a proper size. Do the same with the second frame. Finally, reveal the hidden glass shapes and reduce the Opacity in the Transparency panel, making the back faces of the lantern visible. Cut out the holes in the back faces as well. Move on to the chimney. Let’s make it look metallic, applying a gold texture effect. Open the Swatches panel, go to Swatch Libraries > Gradients > Metals, and choose the Gold swatch. Apply the swatch to the lower tube part of the chimney. Apply the same gold swatch to the top edges of the chimney. In order to separate it from the tube, Copy the tube shape and Paste it in Front (Control-C > Control-F). 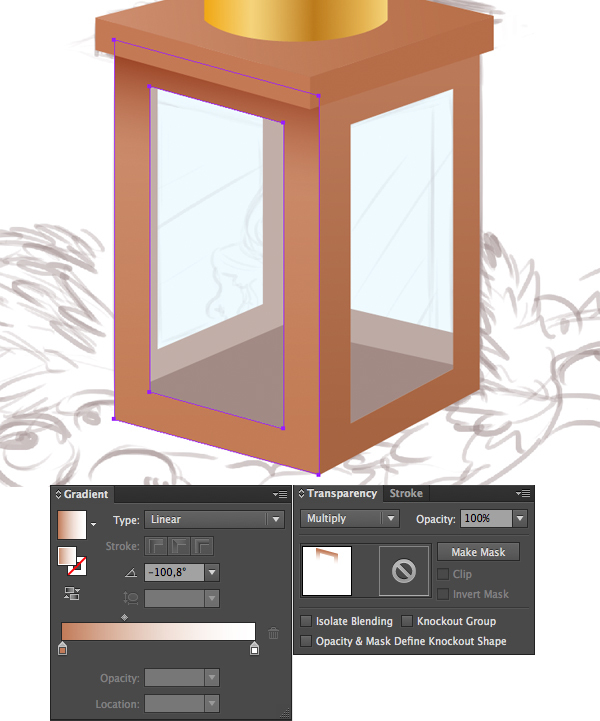 Fill the shape with light brown color and switch it to Multiply Blending Mode in the Transparency panel, lowering the Opacity down to 40% and making the tube slightly darker. 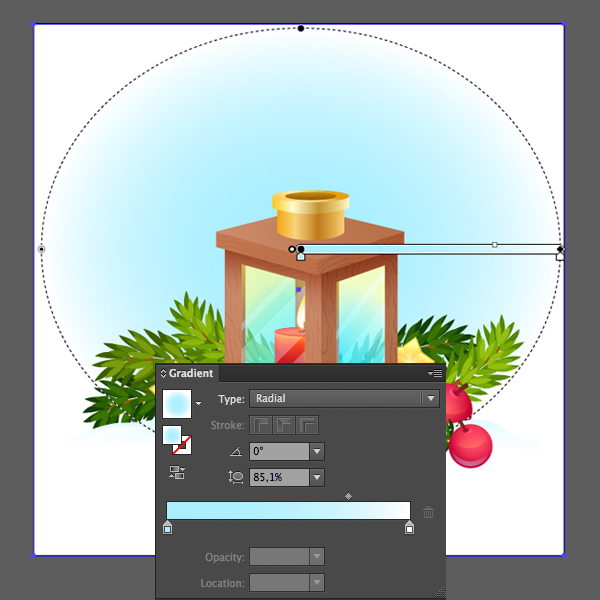 Apply the gold gradient to the top elliptical part of the chimney and add a smaller ellipse in the middle of it. Fill the newly created shape with a simple linear gradient from light brown to darker brown, creating the effect of a hole or cavity. 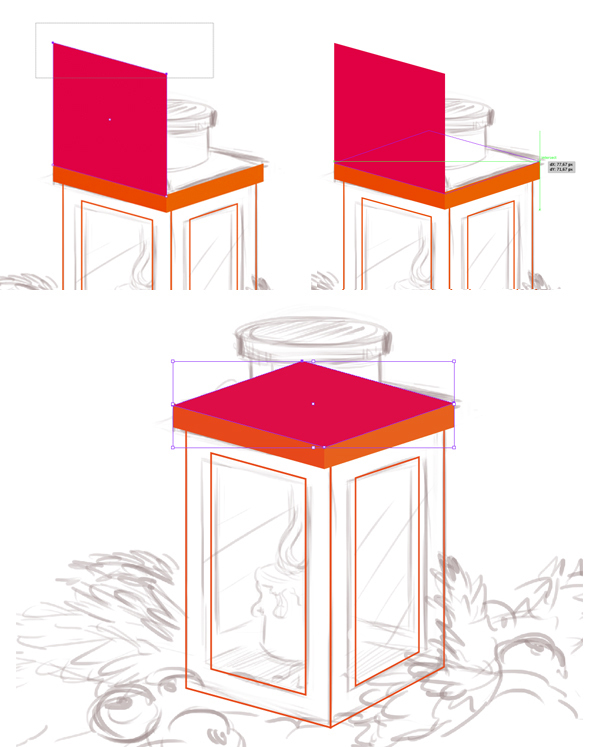 Let’s make the lantern more three-dimensional by adding gentle shadows, which will help to create some depth. 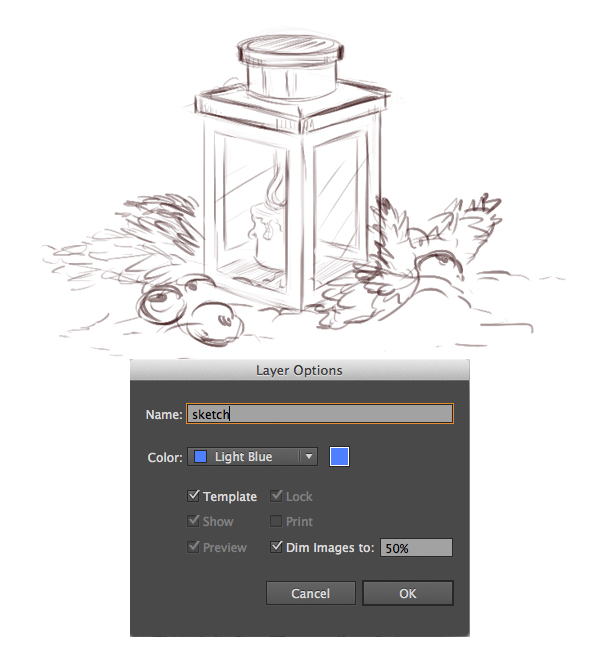 Duplicate the front left frame of the lantern and fill the copy with linear gradient from brown color on the top to white in the bottom. Apply the Multiply Blending Mode, creating a shadow. Add a shadow to the right frame as well, using the same technique. 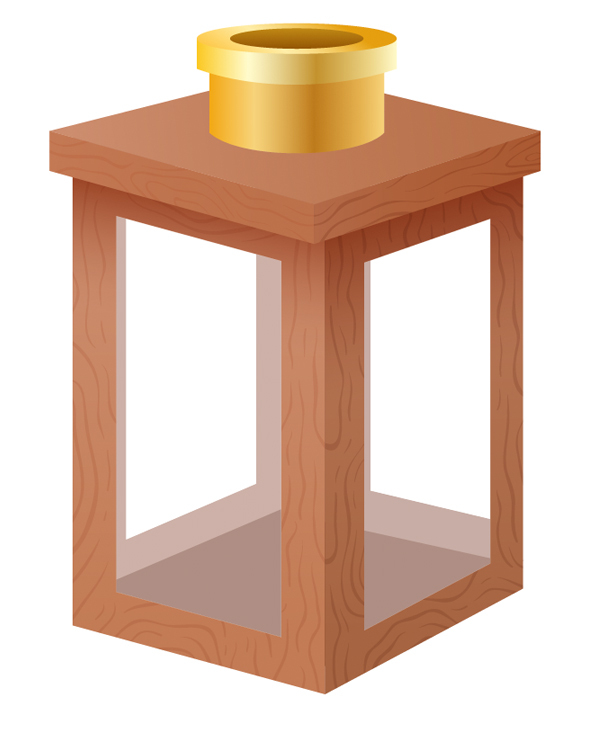 We need to add more realism by applying wooden texture to our lantern. Let’s draw it with the help of the Blob Brush Tool (Shift-B). 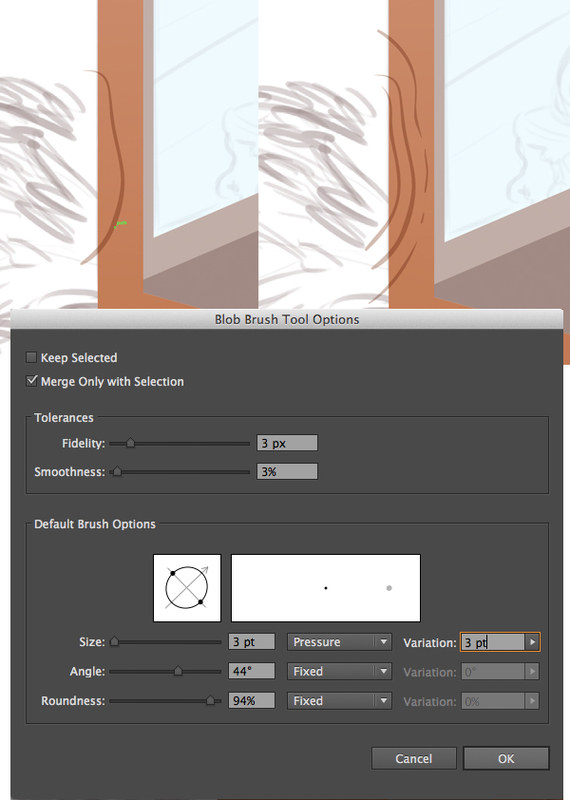 You can see my brush settings in the screenshot below. For more convenience, create a New Layer and start drawing smooth, curved and slightly dashed lines, imitating the growth rings on a wooden plank. Continue filling the blank space with strokes. Don’t worry if they cross the edges—we will get rid of the unneeded parts. Select all the created lines and Group (Control-G) them. Duplicate the frame shape and put the created copy on top (the shape filled with black in the screenshot). 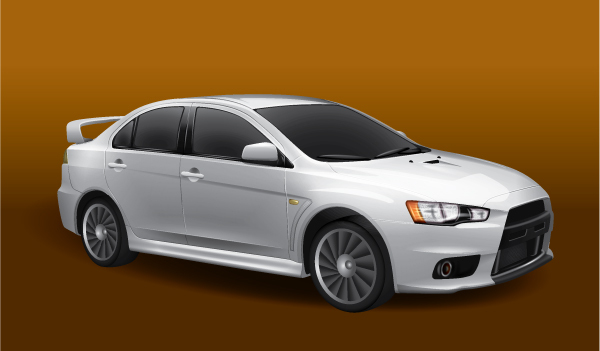 Select both the lines group and the frame copy and click the right mouse button to reveal the pop-up menu. Make Clipping Mask to hide the unneeded pieces inside the mask. 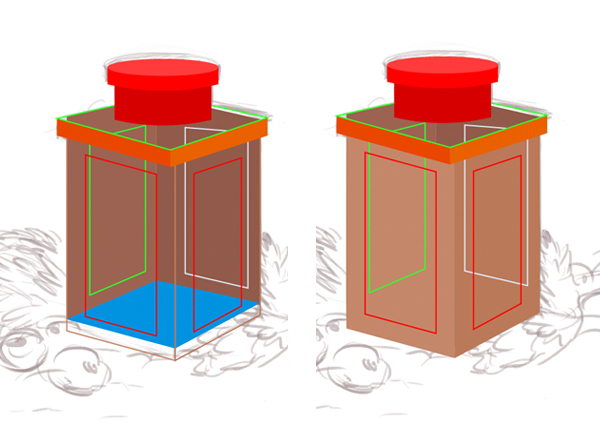 Finally, rearrange the objects (Control-[), putting the masked object above the shadowed frame and below the “roof” of the lantern. Continue covering other parts of the lantern with texture. 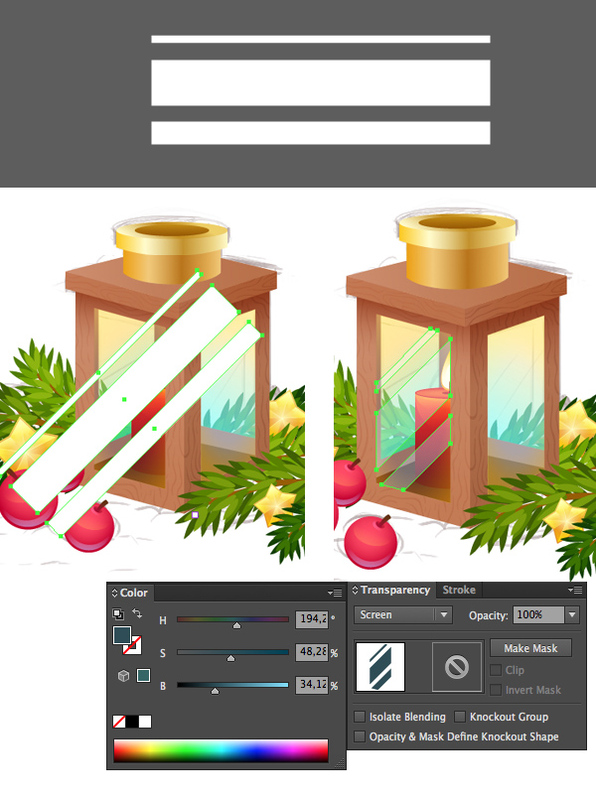 Add strokes to the edge of the top part of the lantern as well. Be sure that the lines match on the edges of the frames, making a single curved shape. It is rather easy to fix the shape, moving the anchor points to the proper positions, as they are still snapped to the Smart Guides. Let’s create a simple candle, which we are going to put inside our lantern. 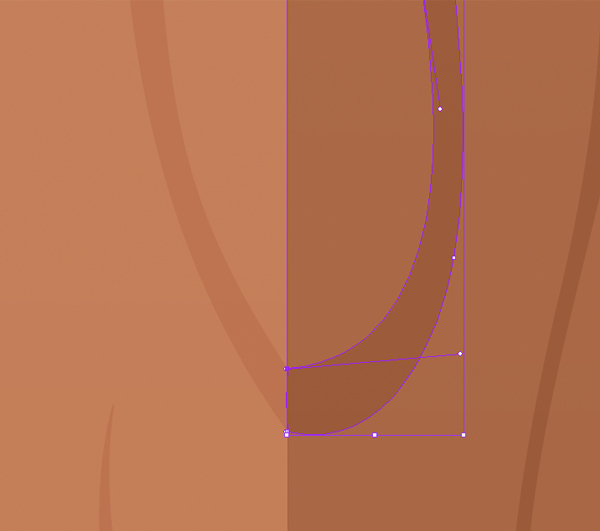 Start by creating two squashed ellipses—one inside the other—with the Ellipse Tool (L). Fill the larger ellipse with radial gradient from darker red on the edge to lighter red in the center. Fill the inner ellipse with a darker gradient to create a cavity, as we did with the top part of the chimney. 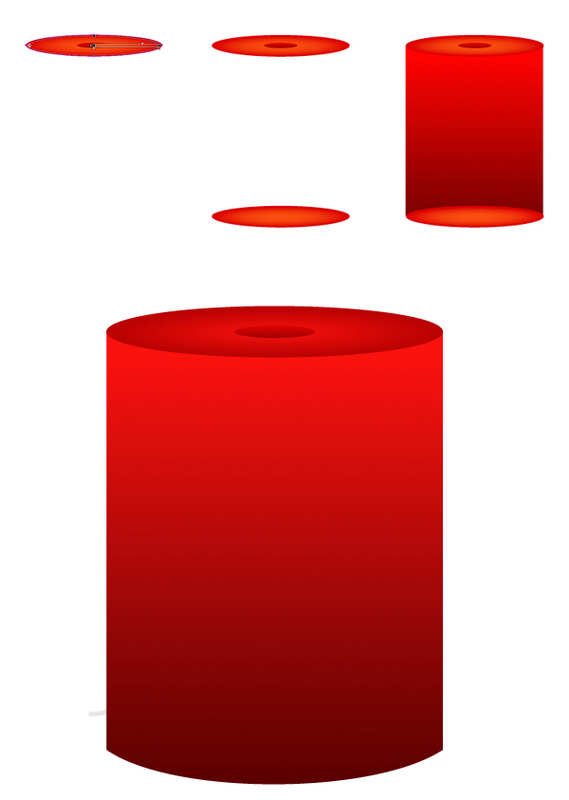 Duplicate the larger ellipse and move the copy down, marking the bottom of our candle. 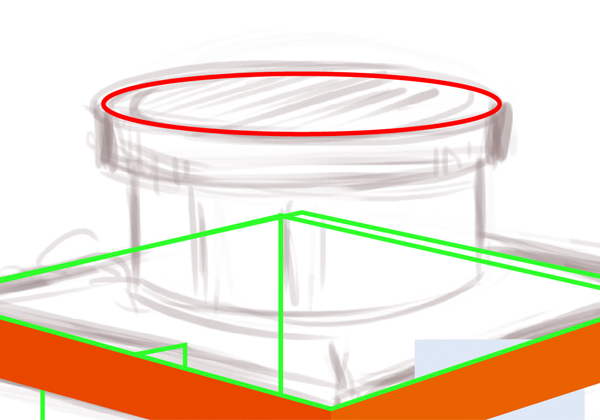 Put a rectangle between the ellipses and Unite the rectangle and the lower ellipse in the Pathfinder panel, combining them into a single shape. 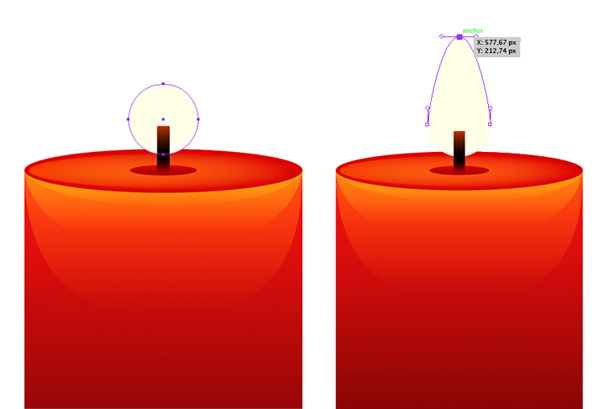 Add three curved half-rounded elements above the body of the candle, making the upper element the narrowest. 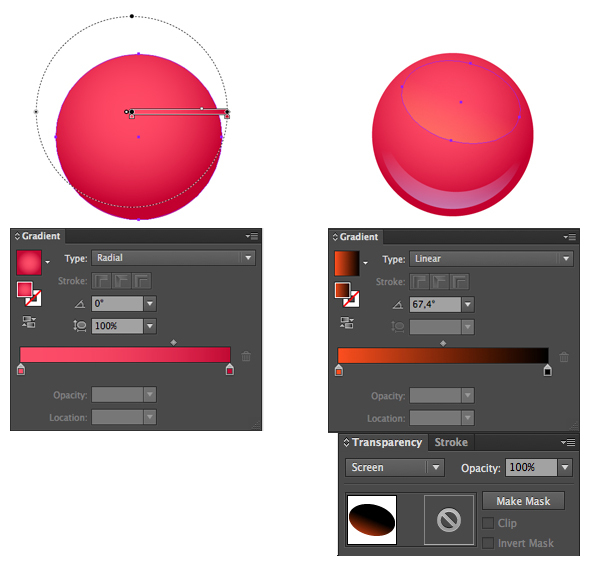 Fill all three shapes with vertical linear gradients from orange to black, switching to Screen Blending Mode, thus making the shapes bright and semi-transparent. This will give our candle a more three-dimensional look. 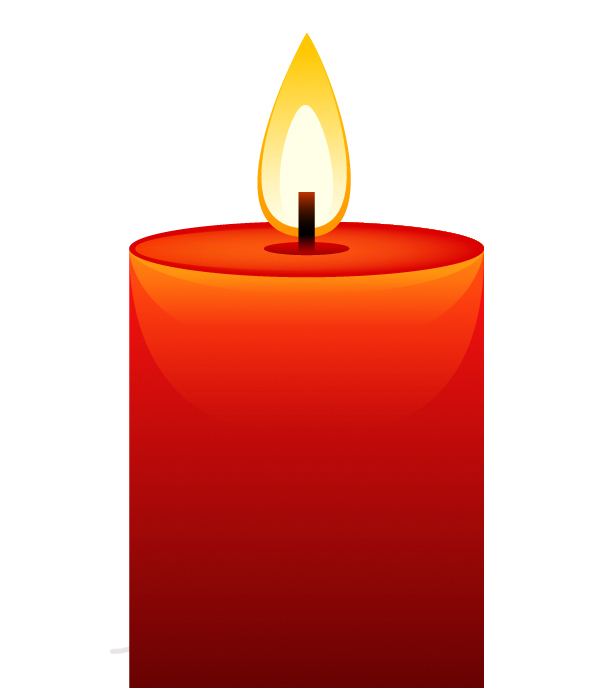 The candle wick is a simple rectangle, filled with a three-colored linear gradient from red on the edges to dark brown in the middle. Now let’s light the candle by adding a flame. Start forming the center of the flame by creating a light yellow circle. 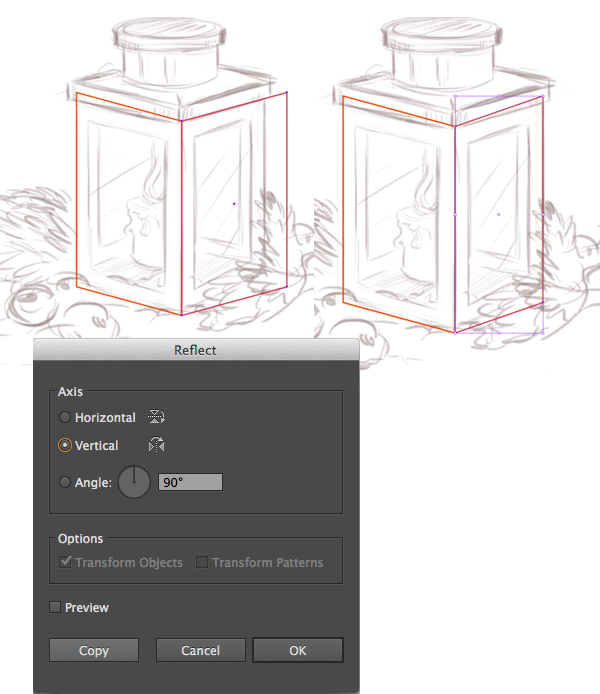 Select the upper anchor point with the Direct Selection Tool (A) and move it straight up, extending the shape. 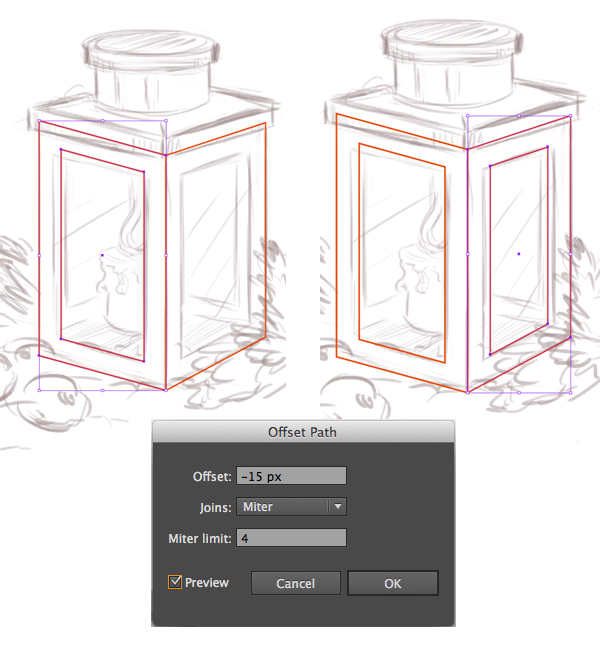 Go to Object > Path > Offset Path and apply the effect with 5 px Offset value. Fill the newly created shape with linear gradient from light yellow to brighter yellow. Use the Convert Anchor Point Tool (Shift-C) to move the handles of the upper anchor point, making the shape more pointed and flowing. Copy the flame shape and Place in Back (Control-C > Control-B), moving it a few pixels down with the down arrow key. 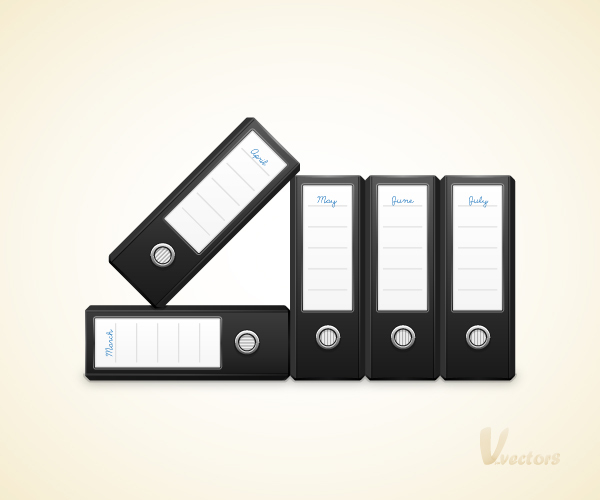 Fill the created copy with a darker orange color. 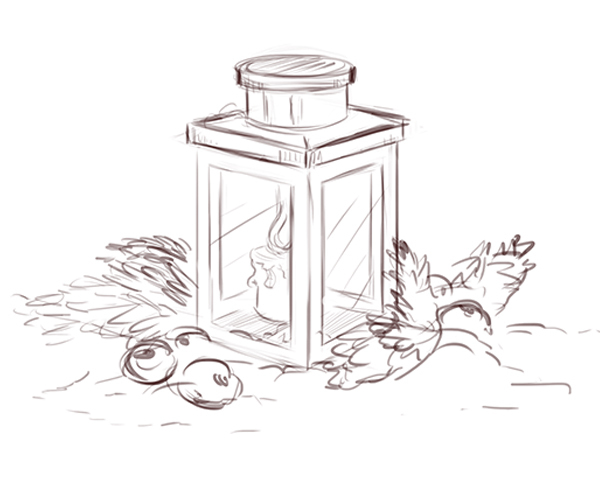 Let’s place the created candle inside our lantern. 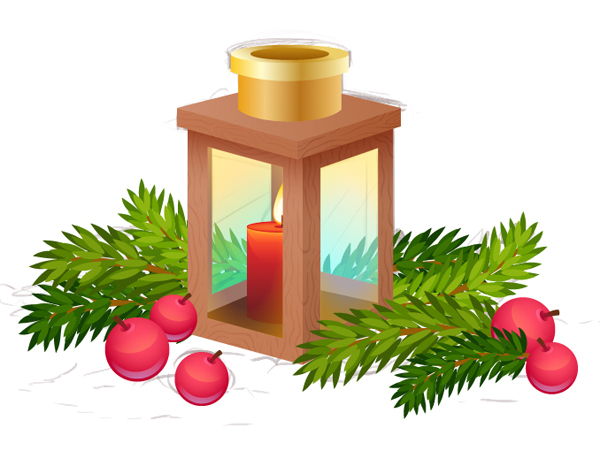 Rearrange the objects, moving the candle and placing it behind the front frames of the lantern. 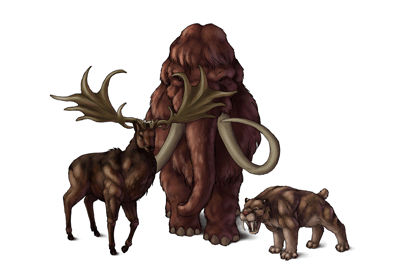 You can move it manually by dragging the object with the help of the mouse directly in the Layers panel or using the Control-[ and Control-] key combinations. Select the glass shapes on the front parts of our lantern and fill them with linear gradients from dark blue in the middle to bright yellow on the edges. Switch to Screen Blending Mode and lower the Opacity to 50%, creating an effect of clean glass with warm overtones from the flame. Move on to the next element of our composition: a glossy red berry. Start by making an even circle with the Ellipse Tool (L) and fill it with linear gradient from pinky-red in the middle to darker pink on the edge. Form a few highlights and reflections in Screen Blending Mode, adding glossiness to our berry. Create a small rounded shape, forming a small dimple on the top of the berry and emphasize it with a tiny highlight. Add a small stem, filling it with dark brown gradient. 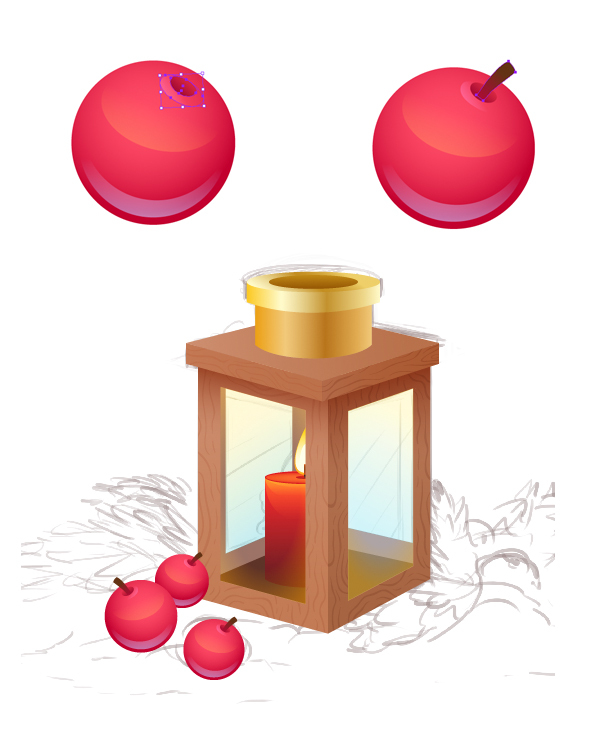 Make a few copies of the created berry and place them in front of the lantern, rotating the berries in different directions. Add some more winter-themed items, such as fir branches, which are very easy to form with the help of the Paintbrush Tool (B) (find out how to make such branches in this Festive Wreath Tutorial and add more decorative elements to your liking). 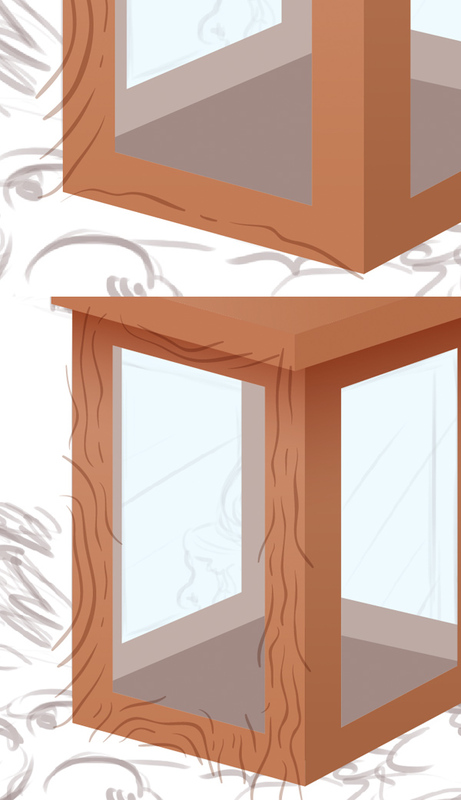 We also need to create some reflections on the glass surface if we want to make it more realistic and smooth. Create a set of narrow rectangles of varied width and turn them into a Compound Path (Control-8), creating a single object. 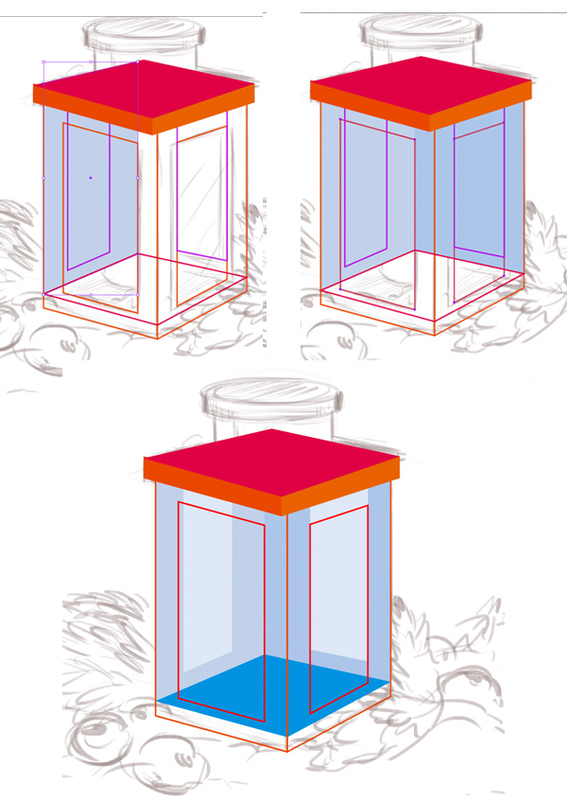 Rotate the stripes and place them above the glass, cutting off the unneeded parts either with the help of the Clipping Mask or the Pathfinder panel. Fill the shape with the dark blue color and switch it to Screen Blending Mode. Let’s add a touch of winter by making a blurred light blue background, reminscent of a frozen window. 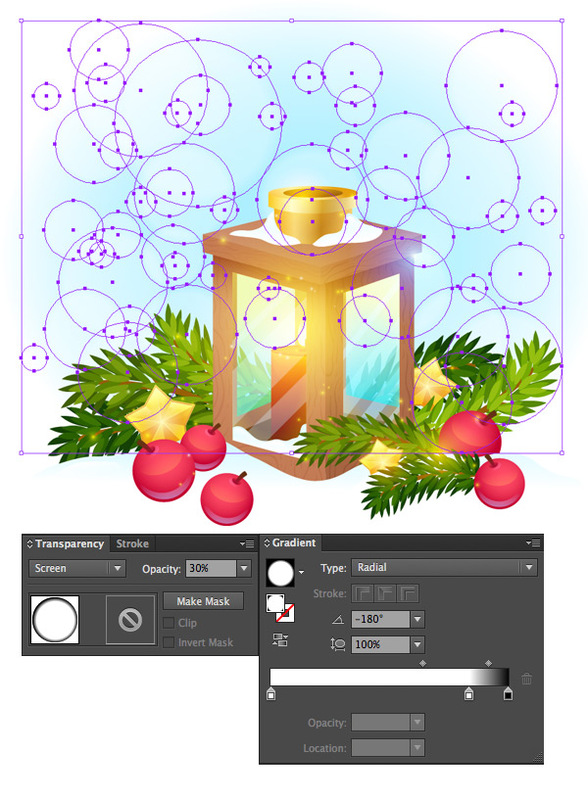 Create a square the same size as your Artboard (600x600 px) and apply radial gradient from white on the edges to blue in the center, placing it closer to the top of the canvas. The lower part of our composition remains purely white. Let’s cover some of the berries with white shapes, as if they are dipped in thick snow. 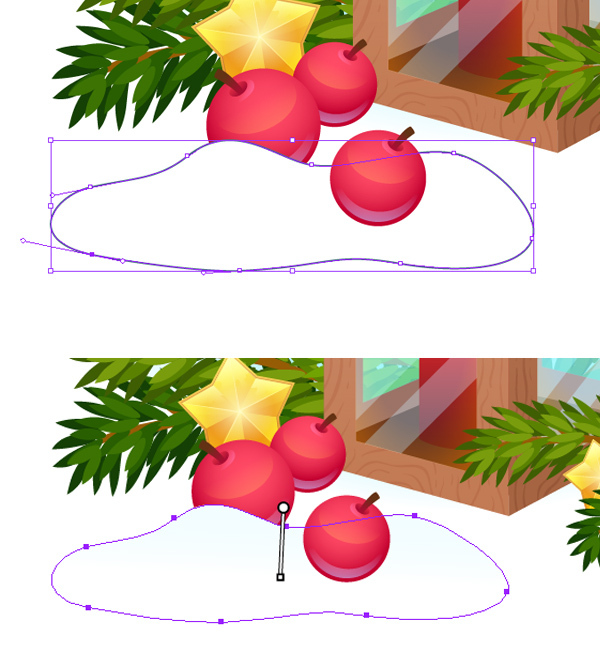 Draw a wavy freehand shape with the Pencil Tool (N) and make its upper part slightly darker with the help of the linear gradient, thus separating the element from the white background. Let’s give our picture a magical look by adding some shiny sparkles. 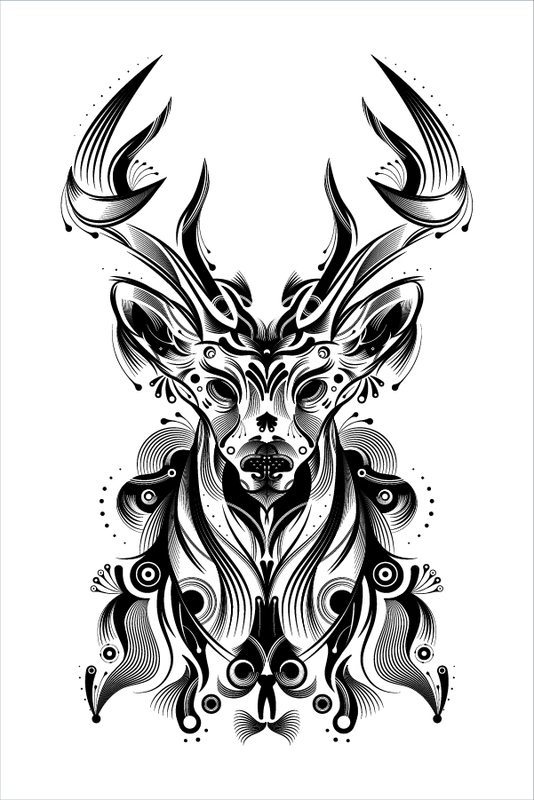 Create a circle and apply a contrast radial gradient from white in the middle to black on the edge. Switch to Screen Blending Mode, creating a tiny white spark. 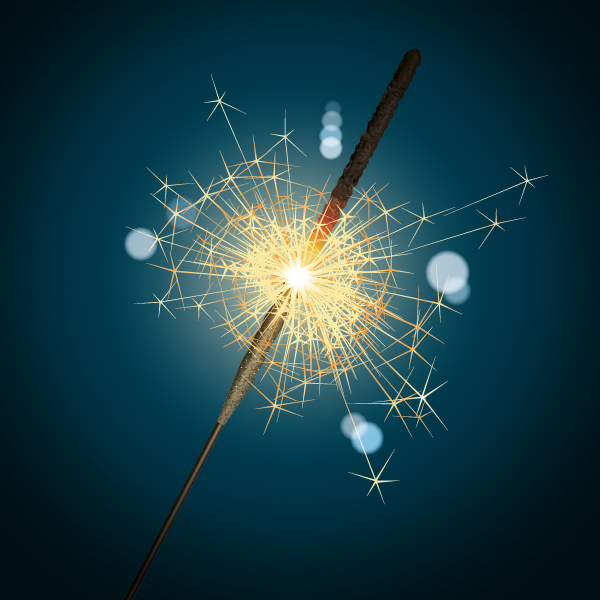 If you want to make gold, blue or other multicolored sparks, just change the center color to yellow, blue, etc. Spread the sparks all over the lantern, increasing the glowing effect by putting the sparks one above the other, making them even shinier. 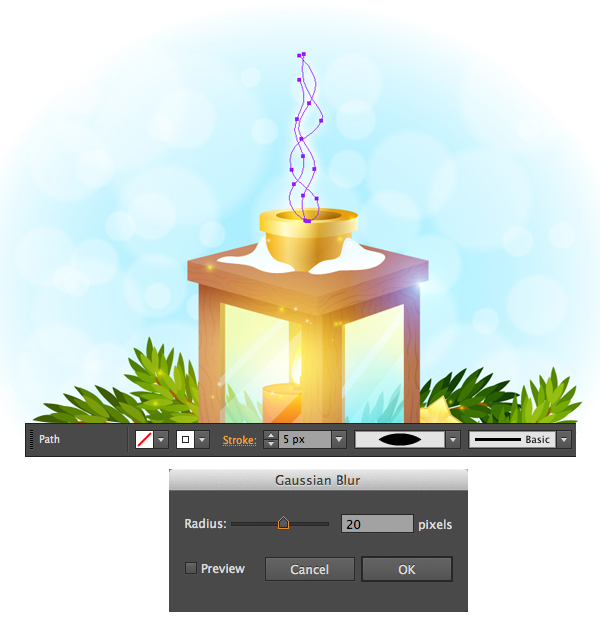 Now let’s add some depth to our artwork by creating a gentle bokeh effect behind the lantern. Form a group of circles of various sizes, overlapping each other, and put them above the background. 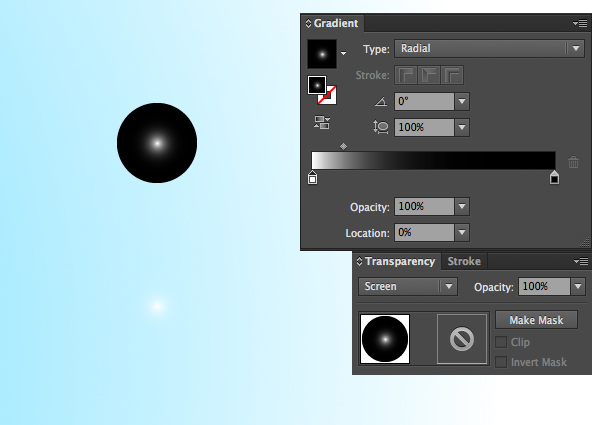 Fill them with the same black and white radial gradient, adding one more white slider in the Gradient panel and moving it closer to the edge, as shown in the screenshot. 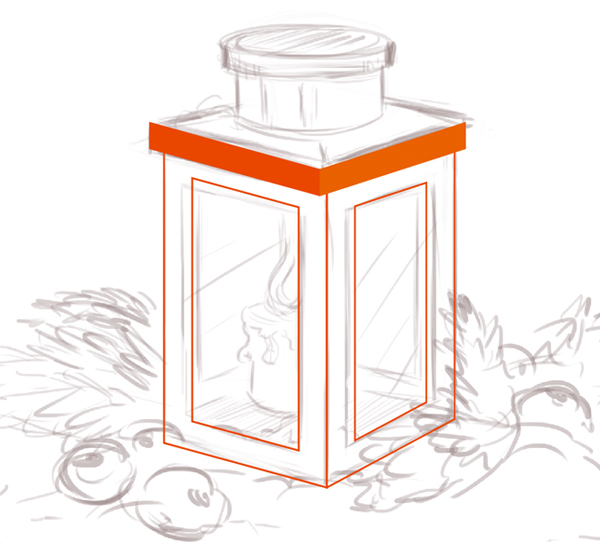 The last but not the least detail will be light smoke coming out of the lantern chimney. 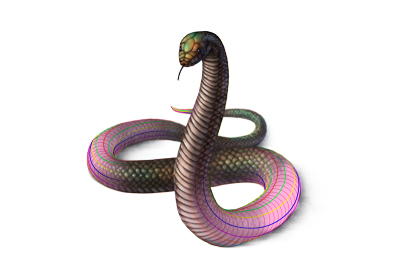 Draw a few wavy lines with the Pencil Tool (N) and switch the Stroke color to white. Select Width Profile 1 in the Variable Width Profile Menu in the control panel above. Finally, select the wavy lines and go to Effect > Blur > Gaussian Blur, setting the Radius value to 20 pixels and making the smoke soft and airy. Great Work! Our Winter Candle Lantern Is Finished! I hope this tutorial helped you to discover some new tips and tricks which will be useful and inspire you to create more whimsical artworks! 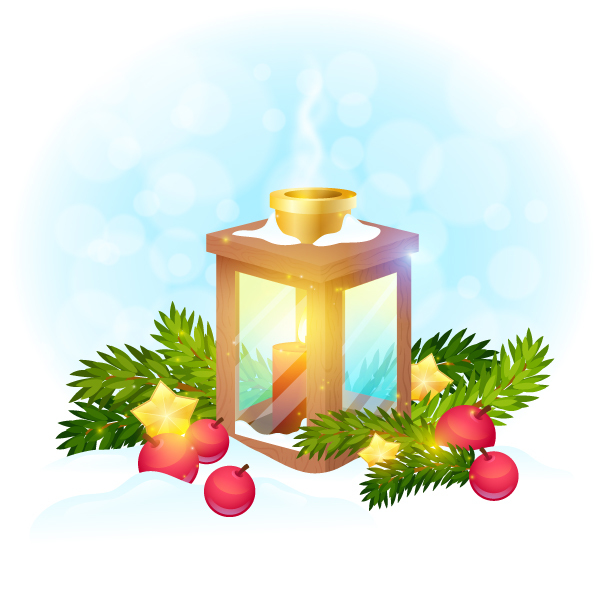 Have a warm and cozy winter!